In part 2, we talked about things you might find at a typical con. Time for more. A further mention of the literature track programming: Many, many SF and Fantasy fans are curious about writing, how their favorite books get written, and what it’s like to be an author. And, of course, many people wish they had a book published. That makes writing panels popular. At some cons, you can assemble your own genre writing workshop, attending panels on self-publishing, working with an agent, story structure, character voice, and tropes to avoid in urban fantasy. You can also network with other new writers. During all this, the consuite is usually open. Depending on the con, this might be a suite with pop, water, and light snacks, to free pubs that serve craft beer, mead, and draft cider, with sandwich and salad ingredients, snacks, and desserts. It’s considered bad form to eat all your meals in the consuite, but they’re great for grabbing some food between sessions, or chatting when you’re not busy with something else. You’ll probably see filk sessions on the schedule. The term began with a misprint of “folk” singing. Filkers have developed their own subculture, and it has its fans and detractors. Many of the songs are SF and Fantasy-themed parodies of more familiar songs. A “Bardic Circle” is the common format, where all the participants take turns singing. If you don’t want to be put on the spot, don’t sit in the circle. Room parties are a common con staple. The con dedicates one or more floors of the hotel as party floors, and if you’d like to throw a party in your room, you register to stay on those floors. Room parties run the gamut from quiet little get-togethers to nightclub-like experiences in larger spaces. One of the ways cons promote themselves is to throw room parties to promote their own event, and talk to guests about their con’s guests and programs. Some rooms are decorated on a theme, have food, snacks, drinks (alcohol and non), and play games like Cards Against Humanity. Finally, there’s tabletop gaming. You’ll probably find a large library of games- some games are scheduled, and there are introductory sessions too. Role Playing Games (RPG’s) are also popular. 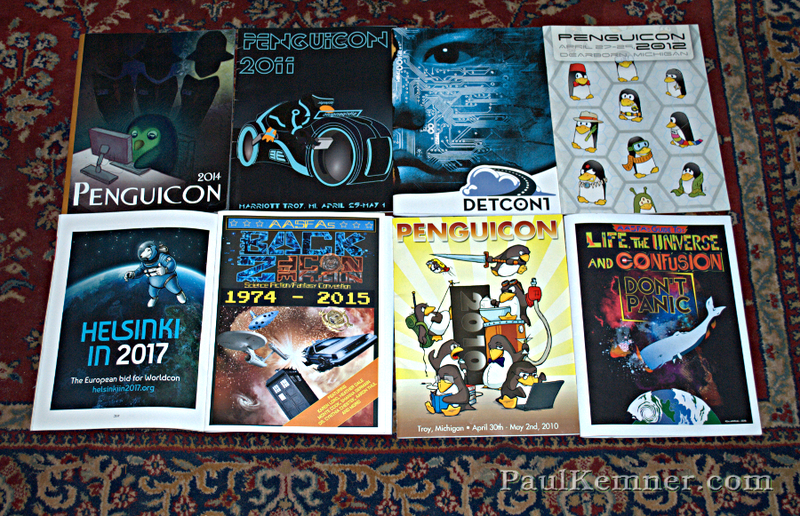 For examples of con programming, here are the schedules for Penguicon 2016 and 2015. In part 4, we’ll start talking about strategies and advice for attending a con and establishing a presence as an author.